Last edited by TNPihl on Sat Feb 07, 2009 1:08 pm, edited 3 times in total. The giant screen at the Tennessee Aquarium IMAX Theater will fill with some of the most colorful and unusual marine life ever seen in 3D on Friday, Feb. 13 with the debut of Under the Sea 3D. Audiences will plunge into the crystal clear domains of a rich collection of underwater dwellers, including the leafy sea dragon, flamboyant cuttlefish, playful sea lions and fierce looking great white sharks. The Tennessee Aquarium IMAX 3D Theater is located at 201 Chestnut Street in downtown Chattanooga. 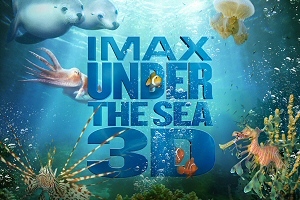 Under the Sea 3D is a new IMAX film shot with IMAX cameras on the coral reefs around Australia, Indonesia and Papua New Guinea. It opens at the BFI IMAX cinema in Waterloo just in time for half term. The film studies various sea creatures such as the garden ells and cutlet fish. The information about coral reefs and the fish that live there. There is also good information about how global warming will affect the sea life. The film is taken from the view point of a scuba diver. From this view point the coral stretches beautifully ahead while various fish swim around going along with their lives. The format is informative and interesting following one creature at a time while still flowing well. Jim Carrey narrates well and the image clarity is amazing. The 3D brings the experience to life as it makes you feel like you are the centre of attention. The sound is immense and the last touch in transporting you to the Pacific. that's pants..........3 cinemas within 10 miles of central London.......Pfssssst! Thanks. No wonder I didn't know it. chips and dip wrote: Thanks. No wonder I didn't know it. I don't think you were the only one.